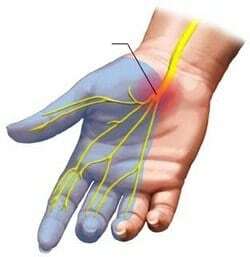 Carpal tunnel syndrome (CTS) is a condition brought on by increased pressure on the median nerve at the wrist. In effect, it is a pinched nerve at the wrist. Symptoms may include numbness, tingling, and pain in the arm, hand and fingers. 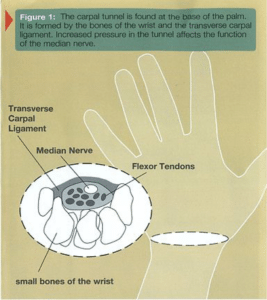 There is a space in the wrist called the carpal tunnel where the median nerve and nine tendons pass from the forearm into the hand (see Figure 1). Carpal tunnel syndrome happens when pressure builds up from swelling in this tunnel and puts pressure on the nerve. 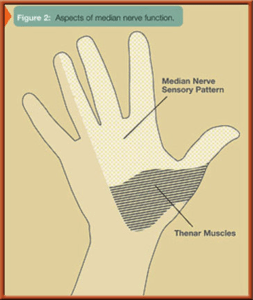 When the pressure from the swelling becomes great enough to disturb the way the nerve works, numbness, tingling, and pain may be felt in the hand and fingers (see Figure 2). A detailed history including medical conditions, how the hands have been used, and whether there were any prior injuries is important. An x-ray may be taken to check for the other causes of the complaints such as arthritis or a fracture. In some cases, laboratory tests may be done if there is a suspected medical condition that is associated with CTS. A nerve condition study (NCV) and/or electromyogram (EMG) may be done to confirm the diagnosis of carpel tunnel syndrome as well as to check for other possible nerve problems. Symptoms may often be relived without surgery. 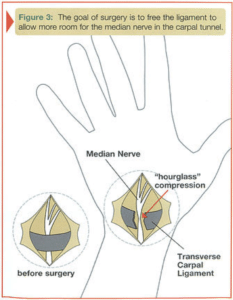 Identifying and treating medical conditions, changing the patterns of hand use, or keeping the wrist splinted in a straight position may help reduce pressure on the nerve. Wearing wrist splints at night may relieve the symptoms that interfere with sleep. A steroid injection into the carpal tunnel may help relieve the symptoms by reducing swelling around the nerve.